Do you ever feel like a mouse in a maze looking for the ever-elusive cheese? For the social sector, the cheese is money and, with that money, comes impact and relevancy to our community as well as our stakeholders. Recently, we have seen the sector shift toward collaboration – which was our theme for the year. This shift is changing the dynamics of the social sector. 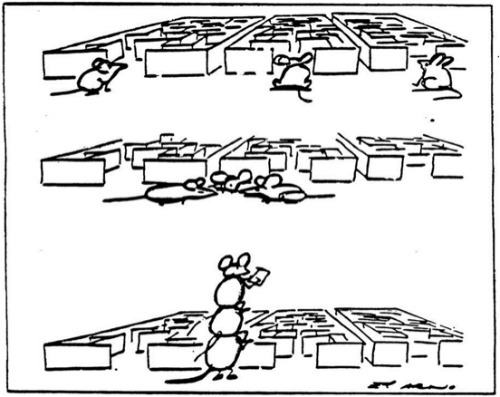 Instead of each mouse looking for the cheese individually, a group of mice is working together to figure out the maze or, even more importantly, change the maze altogether for those we serve. To help model this behavior, we often ask our collaboration clients to take off their “organization hat” and put on their “community hat.” It is a simple ask, but it really works. Just like the mice, the conversation changes from what we call “ego-thinking” to “eco-thinking.” We have written about this concept many times in our coverage of coopetition, collaboration commandments and movement building. However, in our experience, as a sector we still focus on how our own organizations can make a difference (i.e., ego-thinking) rather than on the role we can play to best move an issue forward by working together (i.e., eco-thinking). In the past five years, our team has been working hard with some forward-thinking clients and community builders across many sectors (e.g., healthcare, seniors, workforce development) to develop a new tool – ecosystem mapping – to address the gap between “ego-thinking” and “eco-thinking.” We presented it for the first time at the U.S. Conference of Mayors in August 2014, and we continue to find it a valuable tool for all social issues. While it is as much of an art as it is a science, we wanted to share our thoughts on how to do this in your community, organization and region to break down the silos and start implementing the practice of eco-thinking. Ecosystem mapping takes system change to a practical level. It helps you uncover aspirations for the system as well as the ability to identify strengths, gaps and opportunities for collaboration. When completed, it can help with planning, sequencing and prioritization. It allows you to understand the interactions within the system and supports alignment of activities. It can also help funders allocate resources and support joint decision-making. What is an Ecosystem Map? How do I start? Like all the best tools, it is a relatively simple process, but requires discipline to execute. One of the best parts of ecosystem mapping is that it is a visual representation of the system, which provides a fresh perspective. To start, it is always best to design the ideal system for a community using best practice research. This step is the difference between asset mapping and ecosystem mapping. Asset mapping typically inventories the existing system. Ecosystem mapping maps both the ideal system and the existing system, allowing for comparison and identification of gaps and opportunities for improvement. Once this is complete, use an inventory to add in organizations providing the services. Finally, analyze the system: what is working? What could work better? Do you have the quality and quantity of services needed? What sequence works best for clients? Why does Ecosystem Mapping work? In our experience, ecosystem mapping allows those in the social sector to focus less on individual organizations and more on how organizations can engage in eco-thinking, that is, collaborate to create a stronger system. Most importantly, it allows us to comprehensively evaluate the effectiveness of the system for our customers. This is still a new process, and we welcome your feedback about what you are doing in your community to support eco-thinking. I’d appreciate advice to find a SIMPLE online eco-mapping tool, to BEGIN to benefit from eco-mapping in an online collaboration, team context. This eco-mappingis perhaps a preliminary stage of more complex network-mapping & -analysis (see: http://irvinenewleadershipnetwork.org/networkmapping ). Thanks. I wish we could turn the process into something simple online – it is more complex than I wish and I’m afraid the work product would suffer. But, let me think about it. I am rolling out an e-learning platform in early 2019 and maybe we can do a session to teach people how to do it so it can be DIY. I don’t know of anyone who has done it, but if you find anything let us know!